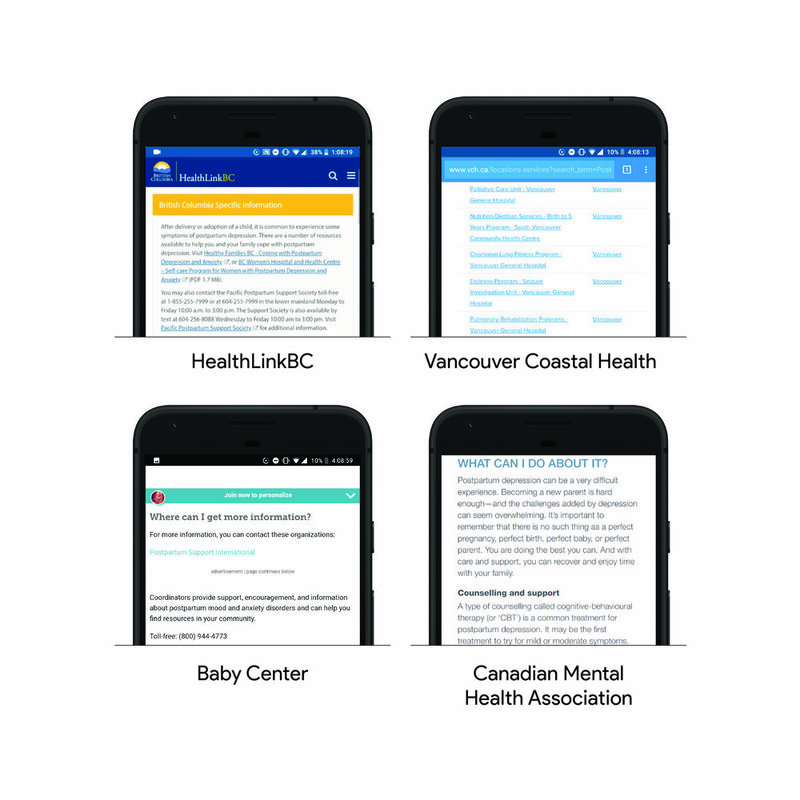 We proposed a Google platform which acts as a springboard for new, urban, low-income parents, to access relevant information and services for postpartum depression. By providing comprehensible information and tools in a timely manner, we support parents by encouraging them to seek professional help. This project was created as a graduate level design project showcased to industry professionals in Vancouver, BC. Receiving high praise, the project was widely regarded as one of the top 2 concepts and presentations of the semester. The course, IAT 499, afforded us the mentorship and collaboration with Will Odom, Amy Chen, and Stevie Nguyen. We were offered the course through competitive admission, and were 1 of 3 remaining groups to complete it. Working with a handful of parents and professionals passionate about tackling a difficult problem encouraged us to be accurate and persistent. See our final keynote presentation here. My responsibilities as a visual and UX designer involved bringing low-fidelity wireframes to high-fidelity mockups, visual and art direction, and research and user testing. I also had major roles in concept ideation, copywriting and UX strategy. Postpartum depression is a mood disorder that begins during pregnancy or may occur within the year following childbirth. Symptoms that parents may experience include uncontrollable crying, feeling worthless or guilty, and not being able to bond with their baby. This can last for many months or even longer, often resulting in a negative long-term impact on parents and their children. 10-15% of all birthing persons will experience postpartum depression. Other factors such as past depression may increase an individual's likelihood of experiencing postpartum depression. If postpartum depression is left untreated, it may develop into chronic or recurrent depression. This ongoing depression in a parent can contribute to emotional, behavioural, cognitive and interpersonal problems in their child’s later life. We began by defining the problem we were targeting through our secondary research, summarized by the following quote. We’ve further decided to focus our project on new, urban, low-income parents, as our secondary research revealed that those who are socioeconomically disadvantaged are twice as likely to experience postpartum depression. The prevalence of postpartum depression was also twice as high for parents living in urban settings as opposed to other areas. The statistic drove us to find out some reasons why low-income parents were more likely to experience PPD. From our research, we realized that information about postpartum depression has poor accessibility. So the goal of our project is to improve access to and comprehension of this information in order to support our target population in engaging with professional help. We recognize the sensitivity of our project as well as the risks that may come with it, such as inducing unnecessary stress or anxiety in new parents, which may increase their risk of experiencing postpartum depression. Not assuming the needs of new parents allowed us to open-minded and empathetic. We acknowledge our own inability to effectively diagnose postpartum depression, typically accomplished by health professionals using the Diagnostic and Statistical Manual of Mental Disorders (DSM-V) to evaluate a patient’s reflection of diagnostic criteria. We therefore focus on the realization of symptoms and the risk of PPD as opposed to interpretation or evaluation of symptoms towards an actual diagnosis. In our process, we first conducted extensive secondary research to help scope our project and identify the target population. We then followed an informed consent protocol and did some primary research with 6 new parents through online surveys to gauge their awareness of postpartum depression and to better understand their postpartum experiences. Finally, we met with professionals including a family physician, social worker, and financial advisor to get a more in-depth view of this population’s life and to also proof our concept. Interviews and online surveys following an informed consent protocol were leveraged to gain valuable insights about our target audience. Each questions' intent and impact to our design was predefined to allow us to interpret our data effectively. Understanding and addressing the needs of a new parent meant also understanding and subsequently addressing the needs of the child. As part of our research, we identified the following barriers which may inhibit new, urban, low-income parents from engaging with postpartum depression services. For example, there may be inconsistencies in healthcare which result in a lack of referral to postpartum services. Or service schedules are tailored more towards families who can take time off work, whereas low-income families may not be able to afford taking time off. I compiled the research sources and formed takeaways to begin assembling a foundation for our design. 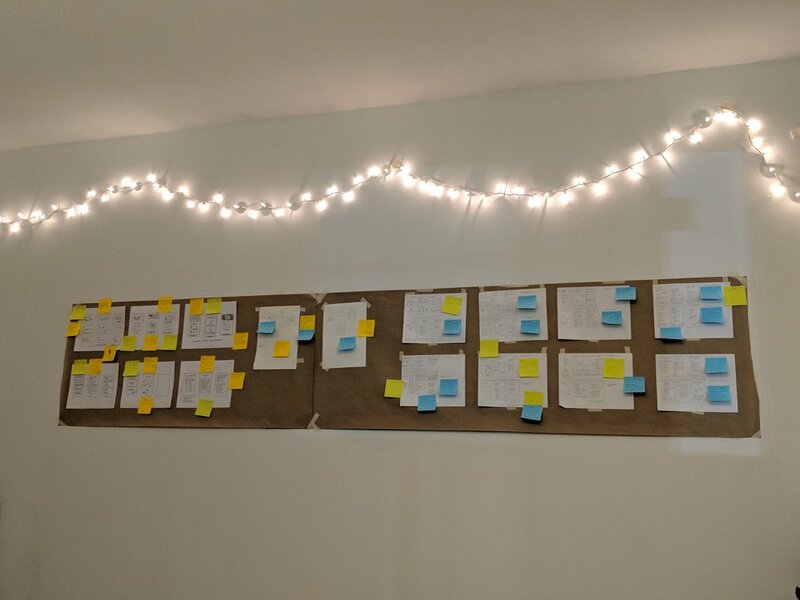 From these, we identified the three overarching barriers of (1) limited time, (2) a lack of accessible information, and (3) difficulty finding services. A list of barriers for low-income parents was compiled from all our research and sources. How might we support new, urban, low-income parents who may be experiencing or might be at risk of postpartum depression in seeking professional help? In response to this, we studied different channels or mediums that this population may interact with, such as social media platforms like Facebook, or a dedicated mobile apps. I mapped out the existing journeys of several existing channels and their frictions for a better view of the current experience. From our research, we learned that this population had pre-existing practices in accessing the internet through smartphones to look for information regarding health and childcare. We also learned that this occurred over short periods of time, for only 10-15 minutes per day. For these reasons, our intervention will not only on augment online sources, but take advantage of mobile platforms. Various academic studies' data ere verified by professionals and used to determine these pre-existing practices. In order to explore the current mobile experience, I performed an in-depth competitor analysis into the current resources found on mobile and surfaced these key barriers. I was met with walls of text and seemingly redundant suggestions for help. Information overload on websites, crowded or irrelevant results, and the use of impenetrable medical language all presented as barriers in accessing and understanding information. Parents were not able to effectively digest information about postpartum depression, let alone find practical ways to do something about it. Four examples of resources I explored from Google Search's most popular results for postpartum depression care. How might we facilitate the information-seeking process so that new, urban, low-income parents are better able to find postpartum information in a timely manner? Our solution to both framing questions is a platform which leverages the Google Knowledge Graph in order to surface information about postpartum depression from credible sources and connect our users to the relevant services. We decided to use Google as the primary platform for our intervention since mobile searching is already a habit for our users, improving the chances of long-term adoption in comparison to a dedicated, separate app. We studied Google’s Knowledge Graph (AKA Health Cards) as a precedent. It is a knowledge base that has been widely successful in refining search results and removing the need to click through websites by pulling information directly from credible sources. This is particularly beneficial for our users who have little time to do research. Screenshots from Google's current Health Card for major depression. Currently, postpartum depression does not have it's own dedicated knowledge graph. Initial versions of our project adopted headings similar to current Health cards that simply stated facts, causing it to sound fairly bland and unrelatable. Upon analyzing the content strategies of Zendesk, Wealthsimple (chosen for how they explain complex applications) as well as Maven and Clue (notable women healthcare apps), we found that when describing information, the ‘hooks’ are those that emote the content in order to initially prepare and engage the reader. Sometimes it helps to distill the ‘feelings’ of an idea and then describe them in more detail. Mind, a UK mental health charity and online resource, also had numerous techniques that we were inspired by. Drawing from an interview done with Francis Roland, a senior UX architect at Sigma, we adopt approaches to more empathetic engagement with users, such as quotes, more accurate imagery, and presenting information in a calm manner. We distilled some of Mind’s design decisions into insights we could adapt into our project. Our solution aimed to match the previously defined overarching barriers to ensure it appropriately provides value. 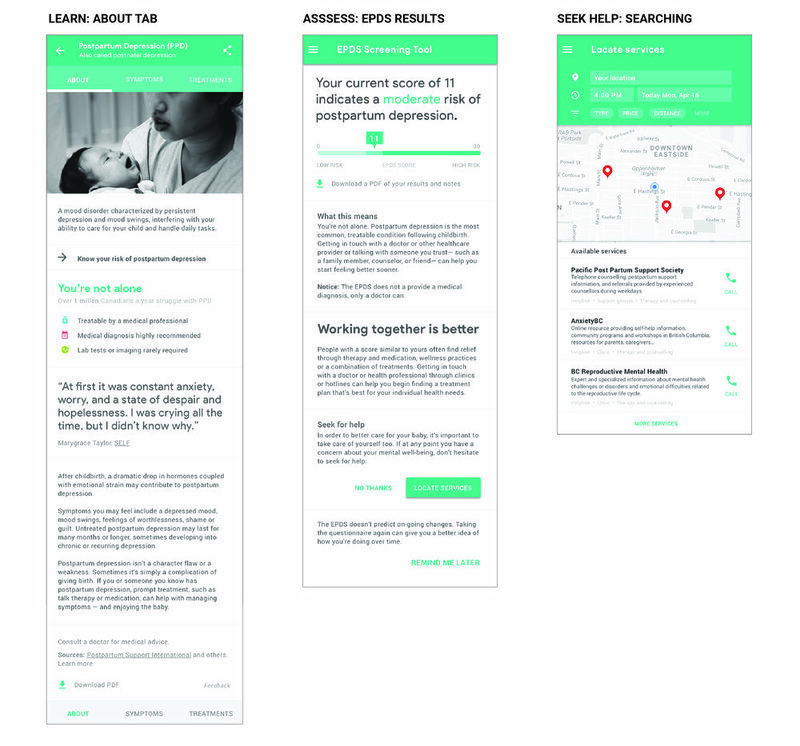 Our design can support new, urban, low-income parents in overcoming the barriers of information-seeking and receiving help by immediately surfacing the most relevant information about postpartum depression in the form of a health card. We provide filters for locating services, so that users are able to quickly and easily find the services that meet their specific needs. In order to improve access to information, our design considers how this population already behaves; which is to search for health information online through their smartphones. We’ve executed on these design decisions across the 5 stages of our intervention. To help describe our intervention, we’ll ground it in the following scenario. While this is one, probable example, it doesn't aim to represent all the circumstance a parent might experience. During breastfeeding, a parent may experience discomfort, pain or difficulties which may prompt them to seek for information or help. But because they have to care for their child at home, they turn to the Internet in order to either find quick, temporary solutions or more information about what they’re feeling. In this scenario, the new parent might not be aware that difficulties breastfeeding, especially any prolonged pain, is a common symptom and precursor to postpartum depression but instead a normal part of being a parent. As such, they may be googling for postpartum care indirectly. We also knew that our design couldn’t automatically assume that a parent is experiencing postpartum depression. So we developed more subtle ways of integrating information about postpartum depression in the "People Also Ask" section. Clicking into postpartum depression will bring them to our next stage. A variant entry point was also created for related symptoms. We borrow Google's related health conditions pattern for a less startling way to introduce postpartum depression to a sensitive audience. In the Learn stage, a health card provides a quick overview of what postpartum depression is, as well as more detailed information about symptoms and treatment options. CTAs to know their risk or locate services are strategically positioned. We build on the basic framework provided by the current Health Card and made some of our own design decisions. In this stage, we begin making design decisions outside the Google Knowledge Graph frame we started with (images, headings, in-line quotes). I advocated for a more authentic approach. My thinking was that the more genuine we could be, the easier it is for someone to identify postpartum depression within themselves. I leveraged as many elements within our constraints as I could. Mental health screening tools can help raise awareness and support seeking help earlier. But because our target population may not be aware of mental health screening tools due to systemic barriers, we decided to integrate the Edinburgh Postnatal Depression Scale (EPDS), a 10-item questionnaire widely used by health professionals to screen birthing persons for postpartum depression. Before the user takes the EPDS, we set the expectations in that it is a screening tool which does not provide a diagnosis, and that regardless of the results, it is recommended to consult a health professional if there are any concerns. While taking the EPDS, users will be presented with a total of 10-questions that ask them to reflect on how they felt in the last 7 days. 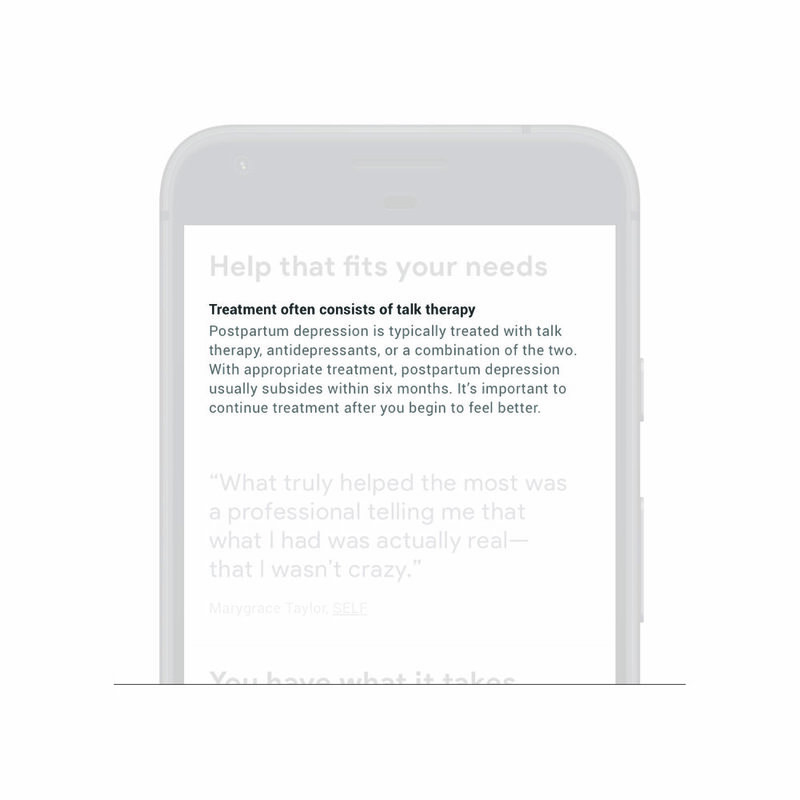 In order to support our users in having more informed conversations about postpartum depression, we encourage them to explain or elaborate on top of their answers through the “add notes” function. Once users complete the questionnaire, they will receive a score indicating their level of risk and what it might mean. At this time, the results can be downloaded as a PDF for offline use and will not be saved by Google. We remind the user again that the EPDS only screens for postpartum depression and that a diagnosis or treatment plan can only be provided by a health professional. So to support our users in engaging with professional help, we implemented a CTA for locating services. Finally, the “Remind me later” section provides opportunities for the user to more consistently take the EPDS which will provide a clearer picture of their mental well-being over time. Reminders can be set via email, text, or calendar events. Our research indicated that for new, urban, low-income families, locating services is the hardest part of getting help, especially if time or money is a concern. In order to help our users find services that meet their specific needs, we provide filters for availability, the type of service, its cost, how far away it is, or additional things that might be helpful for their visit (such as free parking or on-site childcare). The last part of our intervention involves “saving” services for later. The reason we did this is because our research revealed that our target population uses technology in short bursts; often only 10-15 minutes per day. The side menu here provides an easy way to access “saved” services and provides a sense of continuity so our users can pick up where they left off. Although our scenario began from an indirect search, we’ve also considered how direct searches for postpartum depression, services or resources such as the EPDS may lead into our intervention. For example, a search for “postpartum services” will display a short list and further allow users to locate and filter services accordingly. Searches for the EPDS will allow users to immediately take the screening questionnaire within the search results. Searches for the EPDS will allow users to take the screening questionnaire within the search results. The colour teal was user tested alongside several mockups of our product sporting different colour schemes. Teal was described and chosen because it felt the most trustworthy and reliable. The images were curated to show the experience of postpartum depression more accurately than people simply holding their foreheads or sitting alone. More relatable images help us convey a more empathetic message overall. Strong quotes drawn from news articles and blogs further help contextualize the user. Descriptions of postpartum depression said in plain language allows parents to better understand and reflect on their own experiences related to postpartum depression. We reviewed and rephrased medical information curated from Mayo Clinic using Google's major depression health card as a guide. Content is explained in plain language to promote a collective understanding of postpartum depression, regardless of whether it's a stressed mother or a concerned family member. We were attentive about where CTAs were presented throughout the product, giving users ample opportunities to act should the surrounding content resonate with and encourage them to do so. We believe our current project reflects a reasonable representation of a Minimally Viable Product. Further improvements we plan to explore are opportunities to grow the platform into a hub of parenthood information involving frequently asked questions. We also see the need to provide ways for low-income individuals without smartphones. By leveraging basic features such as texting and calling, we see ways to provide the same support. Furthermore, the project represents a sector-wide implication that includes other health conditions and their relevant services.